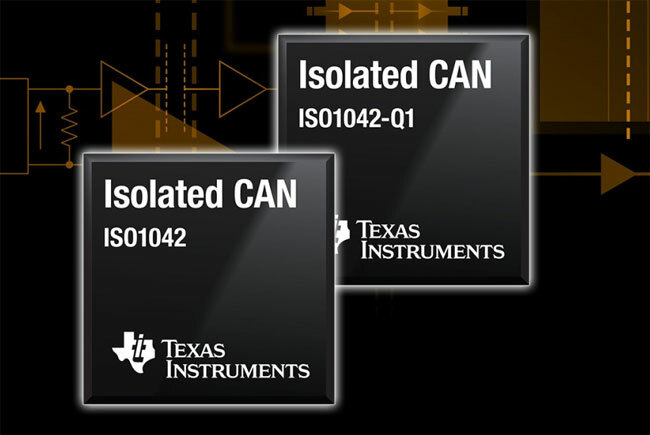 Texas Instruments (TI) has introduced two more CAN transceivers. They offer ±70-VDC bus-fault protection and ±30-V common-mode voltage range. The ISO1042 and ISO1042-Q1 help engineers protecting low-voltage circuits and increase communication throughput in industrial applications such as grid infrastructure, motor drives and building automation, as well as hybrid electric vehicles and electric vehicles (HEVs/EVs). Used in conjunction with isolated power supplies, the devices protect against high voltage, and prevent noise currents from the network from entering the local ground. They also support a wide ambient temperature range of -40 °C to +125 °C. The ISO1042-Q1 meets the automotive industry standard (IEC TS62228) for robust EMC. Both transceivers support CAN FD speeds up to 5 Mbit/s with a short loop delay of 215 ns (maximum), enabling faster payload compared to Classical CAN. With an 18 percent higher working voltage of 1 000 root mean square voltage (VRMS) and a withstand voltage of 5 000 VRMS, the transceivers feature longer lifetimes, resulting in improved system reliability, said the company. Featuring a high bus fault protection of ±70 V, which provides a 20 percent higher short-to-DC margin, the products protect 12-V, 24-V, and 48-V battery or power-supply systems during high-voltage shorts. The ISO1042 and ISO1042-Q1 provide a CMTI of 85 kV/us (minimum) with high ESD (electrostatic discharge) protection of ±8 kV, using the International Electrotechnical Commission (IEC) testing standard, which helps engineers design electronics that can maintain operation in noisy environments. Basic and reinforced options of each device are available in either a 10,3-mm-by-7,5-mm, 16-pin or a 5,8-mm-by-7,5-mm, 8-pin small-outline integrated (SOIC) package. Pricing starts at US-$ 1,69 in 1 000-unit quantities for industrial versions and US-$ 1,99 in 1 000-unit qualities for automotive versions. Engineers can evaluate these devices with the ISO1042DWEVM and ISO1042DWVEVM evaluation modules, available for US-$ 49,00 each through the company’s store and authorized distributors. There are also PDF files describing reference designs (TIDA-01255 and TIDA-01428). Texas Instruments are looking into galvanic isolation for use in Mild-hybrids to full EVs, and also targeting this for the industrial space where the common mode voltage or ground potential difference can be hundreds or even thousands of volts and where isolation can provide protection against this. The company is demonstrating the interoperability of various isolated CAN (FD)-based devices, which implements the ISO1042 transceiver, in hall C4, booth 131 at the Electronica 2018 fair in Munich (Germany) from 13 November to 16 November. The team of TI have built a demo which you can see here in the video. This video shows a demo with three different configurations of isolated CAN and isolated power. Two boards are communicating with each other on a 30 m CAN FD network for each of these three solutions.